The Sunday afternoon I visited the recent ʻProtest & Surviveʼ exhibition at Londonʼs Whitechapel Gallery, I was witness within a period of twenty minutes to four different demonstrations outside the gallery. A single demonstration outside a gallery these days is pretty rare; four is a miracle. That they should all occur around the same time, therefore, was not fortuitous – news had spread that something was going to happen, so others decided to join in. However, the different forms these demonstrations took produced an extraordinary snapshot of the complex mediations of art and politics in the current period. Veiling, ventriloquism and self-irony met and confused and embraced the actuality of ʻﬁrst-orderʼ commitments. The ﬁrst and most prominent demonstration was the reconstruction of Endre Tótʼs 1976 street action TóTaLJOYS from ʻProtest & Surviveʼ, by the two organizers of the show, Paul Noble and Matthew Higgs. A banner proclaiming ʻIʼm glad if this can hang on my neckʼ was propped up on the pavement outside the gallery, while Higgs held a placard which read, ʻIʼm glad if I can hold this in my hand.ʼ Joining them was a group of staff from the School of Art, Design and Media at the University of Portsmouth, protesting against the impending draconian cuts in the school and calling for a teachin at the university. On the other side was a group of activists protesting against the closure of the library next door to the Whitechapel Gallery, into which the Whitechapel is planning to expand. One of the groupʼs placards read, ʻThis is no fake art demoʼ. The idea of trying to prevent your demo being confused with an ʻart eventʼ is clearly a good idea these days if you are demonstrating outside an art gallery, but what the placard failed to take account of was how the groupʼs very ironization of its own commitment rendered it susceptible to its subsumption under the category of art. It took me a while to work out whether they were actually protesting the closure, or a group of artists performing such a protest in protest against such a loss of distinction. Such forms of ironization, self-consciousness and performativity have set out to problematize the public language of socialist and radical commitment for over a century. Indeed, the history of modernism is the history of its attempted contamination and transformation on the part of artists of the languages of propaganda and activism. ATAC are no different in this respect than many other artist-led or culturalworker groups over the last forty years and beyond. However, what is interesting about this convocation of voices outside the Whitechapel is not that it points to how the boundaries between the art event and political protest has a history long embedded in modernismʼs relationship to the Left, but that forms of performativity are being played out within and across the political at present that are transforming the limits of politics in art and the way artists in politics see their relationship to politics. The fact that the anti-library closure protest felt it needed to distinguish itself from any confusion with the art event is a profound reﬂection of the way that the political is assumed now to be either subsumed by the cultural or defeated by it at a more fundamental level, just as ATACʼs taking on the mode of street theatre as part of a broader anti-capitalist movement is evidence of a wider process of culturalization within left politics – a culturalization that is deeper and more fundamental than the debates on representation, pleasure and the popular of the 1980s, or even the radicalisms of the 1960s. This is why it is not that hard to connect what was happening outside the Whitechapel with what was going on in the ʻProtest & Surviveʼ exhibition itself. ʻProtest & Surviveʼ is a show that is claimed by its organizers to reinstate the ʻpoliticalʼ in a period in which art – in Britain, at least – has supposedly left politics behind in favour of insouciant neo-conceptual game-playing. In an interview in the Independent on Sunday published after the show opened, Higgs insisted that younger artists these days would rather get on a coach to visit an out-of-town shopping centre than to support the miners (or any other group of workers). This may be so, but, as the choice of the Tót action suggests, the organizers themselves are perhaps not so uncomfortable with game-playing-as-politics. This would go some way to explaining the popular countercultural focus of the show. The commitment to politics is something that is largely identiﬁed from within the cultural and as such should be seen as no different from the wider processes of the culturalization of politics itself. This is why it is no surprise that the show is chieﬂy preoccupied with its own local art-world concerns: how its ʻcounter-culturalismʼ sits in relation to the Young British Artʼs ʻcounter-culturalismʼ, in order to open up some distance – though not too much distance, mind you – from these artists; and not with some durable and pertinent historical problems concerning the real limits and possibilities of politics in art, of the performative and the constative. The outcome is that the showʼs framework is inert and gestural, for all its recognition of some of the contemporary problems of doing politics and art. By this I mean that none of the critical machinery of politics in art of the last thirty years – praxis, negation, the commodity form, ideology, hegemony and the institution – is invoked or developed in any useful or historically productive way, as if getting too close to theory would somehow freeze thought or action. Such reticence is, of course, standard for artists rightly worried about being thought of as intellectuals and politicos in an art world distrustful of both the artist-intellectual and politics. But Iʼm not too sure how the loose ʻanarchistʼ stance of the show is any different from the platitudes of resistance within a number of other dominant and dissident art-world contexts. 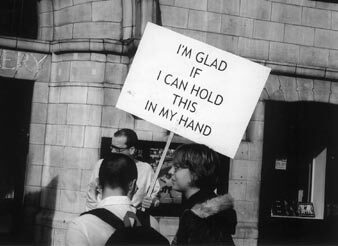 In fact the notion of politics as a protest is fuzzy enough to be indissociable from what you want it to be, including much of the YBAʼs neoconceptualism. The claims for the political in ʻProtest & Surviveʼ, then, are remarkably consistent with the broader ʻpost-politicalʼ culture of the moment, in which both social-democratic traditions on the Left and extra-parliamentary socialisms are seen as equally irrelevant or defeated and as such unusable for the utopian imaginaries of art. Thus, the deﬁning work of the show is without doubt Thomas Hirschhornʼs supragestural Bridge, a wooden passageway constructed to link the Whitechapel café to the anarchist bookstore Freedom Press next door to the gallery, which is obviously where the organizers would like each visitor to end up, suitably chastened. Given this, the regrouping of the very disparate artists in the show (Jo Spence, Tom of Finland, Mel Ramos, Dan Graham, David Hammons) into a kind of informal art brotherhood and sisterhood of ʻprotestersʼ is certainly consistent with the self-images of the moment. For what marks out ʻProtest & Surviveʼ is its fundamental deﬂation of the representational and institutional problems of politics in art – the problem of realism and enunciation (the identiﬁcation/disidentiﬁcation with the other, as a dialogue with the other) and the problem of place and enunciation (the link between site and meaning in art) – in favour of a general enthusiasm for the return of art to ʻlifeʼ and the artistʼs unbounded ʻenergyʼ. This return of ʻart to lifeʼ, essentially, is the codiﬁcation of a generationʼs antipathy to the administration of critique, and as such is little different from the moves made by the YBAs and much other contemporary art in the advanced Western democracies, fearful of the professionalization of critical theory. In this sense ʻProtest & Surviveʼ is part of a familiar watershed moment in art at the point of its globalization in the new millennium. By distancing itself from the ofﬁcial postmodernist machinery of the critique of representation and the institution, ʻProtest & Surviveʼ lifts notions of ʻprotestʼ, ʻthe everydayʼ, and ʻcritiqueʼ out of history and ideology into an indeterminate realm of ʻexperimentationʼ. ʻOur protest is for the survival of idea(l)sʼ, says Higgs. The result is that the possibility of developing a critical framework in which the relationship between enunciation, negation and representation in art might hold on to a more complex and necessarily unstable relationship between the performative and the constative is overturned for a loose embrace between the performative and ʻeveryday lifeʼ. This is why, if what is actually defensible about ʻProtest & Surviveʼ is the turn it takes away from the voluntarism of recent art political theory (so prominent in 1970s art and social practice debates, and in 1980s critical postmodernism), what is problematic about the showʼs contextual voiding of the problems of representation and site (key to much of the better work in the show) is that the voice of political resistance is reconnected to the artist as abstractly creative and utopian. Politics is seen to be interesting only in so far as it is touched by the ﬂuttering hands of the artist and curator, and not as part of collective social practice and experience. The artist as political, rather than the artist in politics, might be seen as the substantive difference between ʻProtest & Surviveʼ and another show of politics in art which was staged in the same month in Britain (November 2000), ʻLook Outʼ, at the Wolverhampton Art Gallery. Organized by Peter Kennard, ʻLook Outʼ in many respects represents the kind of exhibition that ʻProtest & Surviveʼ did not want to be, and that the Whitechapel and the metropolis did not want to see. (In fact, the Whitechapel turned the show down.) If ʻProtest & Surviveʼ positions itself within the conﬁnes of the contemporary art world, Kennardʼs exhibition sees itself as being proudly outside such concerns. But, of course, ʻoutside such concernsʼ is itself questionable, and reﬂects what is limited and equally constrained about ʻLook Outʼ. Indeed, the show plays the politically traditional constative role to the performativity of ʻProtest & Surviveʼ, but without fully recognizing how intertwined the constative (iconic) and performative (allegorical) are in the work of artists in both exhibitions. As Kennard argues in an interview with John Slyce in the accompanying publication, ʻLook Outʼ is ʻabout a direct relationship with the political world and not merely about artʼ. Even if we only singled out those practitioners, such as the documentary photographer Jenny Matthews, as exemplary of this would-be ʻdirectnessʼ, it would be hard to see how this describes the working practices of the majority of artists in ʻLook Outʼ (Mona Hatoum, Stuart Brisley, Cornford & Cross for instance) and how politics in art ﬁnds its audience. Presenting as abstract a notion of politics as that in ʻProtest & Surviveʼ, Kennard plays up the notion of the show as bringing the ʻtruthʼ of the world ʻout thereʼ directly into the gallery in order to ﬁgure a notion of art as allowing ʻpeople to look at their own livesʼ. The ʻbringing-truth-out-thereʼ-into-the-gallery approach to politics in art is, of course, a conventional social-democratic model of ideological appellation, which has been around since the 1950s and the development of the new museum system. The ʻsocial contentʼ of art – which gets moved around in the debate like a hulking great marble statue – is appealed to on the basis of its capacity to ʻraise consciousnessʼ. It was this model that underwrote the doleful ʻArt for Societyʼ show at the Whitechapel in 1978, when the dispute between realist painting and abstract painting was still casting its deathly shadow over the British art world, through the left of the Labour Party and the Communist Party of Great Britain. What connects ʻArt for Societyʼ and ʻLook Outʼ is the simpliﬁed notion that art lifts the ʻveilʼ of ideology and connects people to the world. But what distinguishes ʻLook Outʼ is, of course, the absence of anything approaching the cultural and political context of twenty years ago. Thus, notions of ʻdirectnessʼ and ʻaccessʼ may still overdetermine claims on politics in the exhibition, but as Kennard himself says, the ʻold questions of realism or not realism have been wiped awayʼ – as has the political context in which this debate was formulated. Indeed, if ʻProtest & Surviveʼ mediates politics in art through the crisis of institutional critique after critical postmodernism, ʻLook Outʼ attempts to mediate the crisis of the category of Political Art after the theorization of art as cultural practice and the rise of critical postmodernism. Kennard, then, is not wholly blind to the performative. He recognizes that the artists in the exhibition would not describe themselves as political artists or begin from anything resembling so undifferentiated a category as Political Art. But the performative functions in a similar way to the person on the anti-library closure demo holding the placard saying ʻThis is no fake art demoʼ. There is an obvious need to recognize the excess of meaning that art brings in its wake, but only in order to protect the constative from the performative. Because without the ʻprotectionʼ of the constative from the performative, the honouring of the reality of exploitation and oppression is held to be weakened. This fear of the performative is the aporia that circulates around the political in art, based as it is on its persistent misrecognition of the work of artʼs audience. Political art (as understood on the social-democratic model) assumes that those whom the art work is destined for (the fantasized working class) need art in as much as they need Ideas in order to understand capitalism and class society. There is a never a momentʼs recognition that people are already engaged in practices in the world which are critical and transformative. This might by described as the Rancièrian void at the heart of politics in art: that for all its liberatory claims the category Political Art in fact reinstates the inequality in bourgeois culture between those who supposedly know and those who supposedly donʼt know. As the British group Art & Language said in response to the ʻArt for Societyʼ show over twenty years ago: ʻThe real problem is not how to make art which is pro-working class and anti-bureaucratic but how to be pro-working class and anti-bureaucratic.ʼ The alternative is a bit like the comedian Dom Joly in his sketch of a man walking along Oxford Street carrying a placard on which is written ʻThiefʼ with an arrow pointing to his head. Two policemen run past and ignore him.